The BMU Gerbers are off to China for manufacturing! Weber has ordered 31 boards, each containing 8 BMUs, so we'll have squiggle-joined boards for 248 BMUs. That's 20 spares, and we'll possibly order components for 250 since we often get a good price break at 250. Weber probably won't see this post for a while; his last message to me was at 1:25 am. We discovered a few problems at the Gerber viewing stage, which more or less has to come after a 20-ish stage process of panellisation at the end of EV day. But Weber found several more, over many iterations, hence the late finish. I sure hope we haven't forgotten anything; it would be bad if the boards came back with no fibreglass, for example! 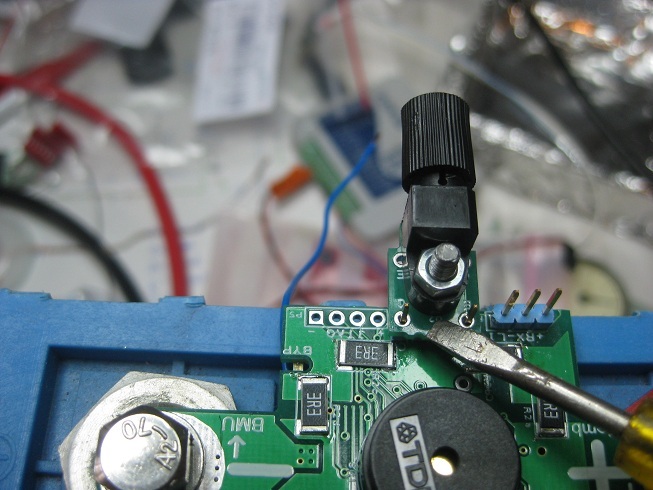 More seriously, a lot of the last minute changes had to do with preventing the solder paste process from becoming a spaghetti making machine (squeezing solder paste into holes or slots). 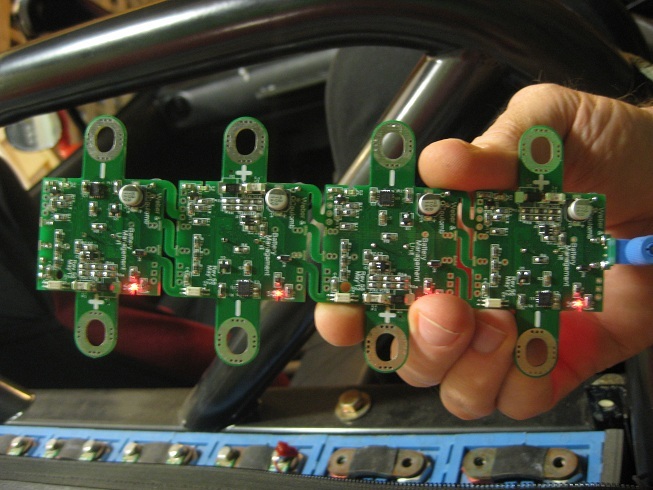 Design for manufacturability (in the sense of automatically populating PCBs with components) hasn't been high in our thought processes until the last minute. Last edited by coulomb on Sat, 05 May 2012, 06:07, edited 1 time in total. Nice work! I had been just sending the Eagle .brd files to PCBcart. On my last order, the proof that they sent wasn't correct a few times in a row so I finally learned how to work with gerbers. It's not too bad, and good for troubleshooting! 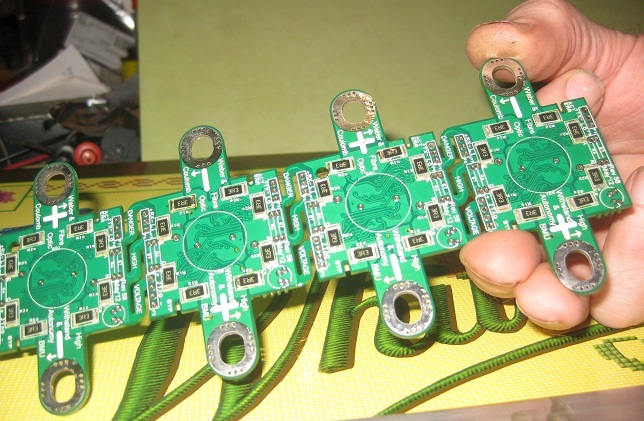 Are you having the boards made and sent as blank PCBs, or are you having them assembled as well? If you're having them assembled, which company have you gone with? 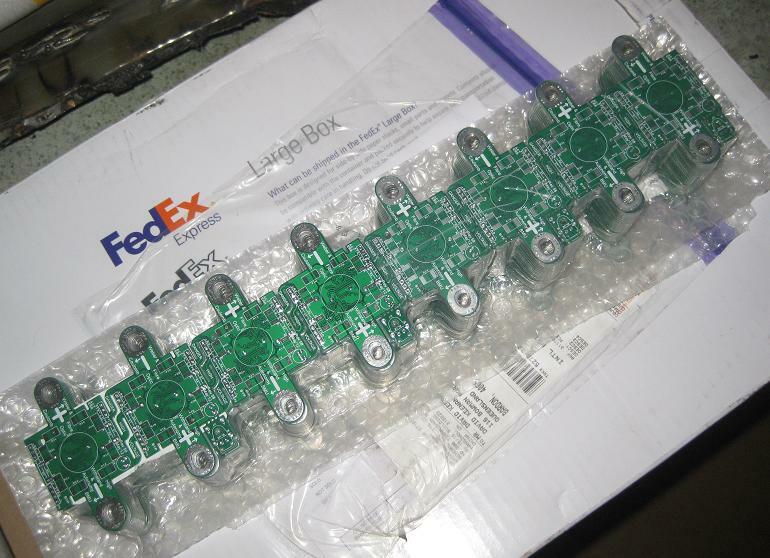 BigMouse wrote: Are you having the boards made and sent as blank PCBs, or are you having them assembled as well? Just blank PCBs. Quite a few of our components are a bit special (e.g. we want a MOSFET with as small a range of threshold voltages as possible, a diode with as small a voltage drop at low currents yet withstand 1000 V, and so on), so we'll likely order at least most of our own components. 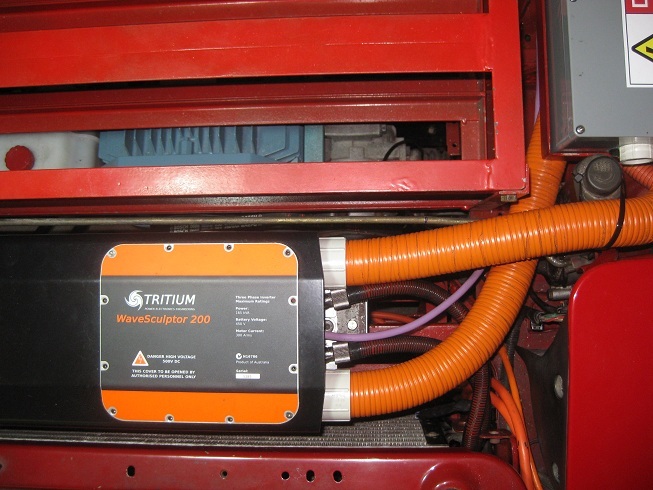 Our celltop BMU is "open source", hosted on SourceForge.net, and can be freely downloaded and edited. The celltopbmu project page is http://sourceforge.net/projects/celltopbmu/. Now that we've sent off the hopefully final artwork, it's probably a good time to document how to access the design files. 1) A Subversion client. Subversion is a source-code version control system that allows many people to access source-code stored in a central repository, in this case on SourceForge. We recommend TortoiseSVN, which is freely downloadable from here: http://tortoisesvn.net/downloads.html . 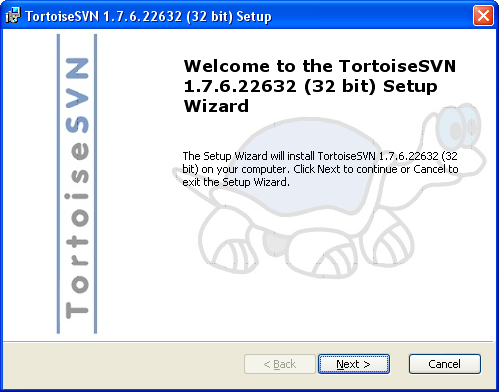 There are plenty of other subversion clients, but I'll show examples for Tortoise only. For others Subversion clients, the key URL is svn://svn.code.sf.net/p/celltopbmu/code/ (changed late May 2013). 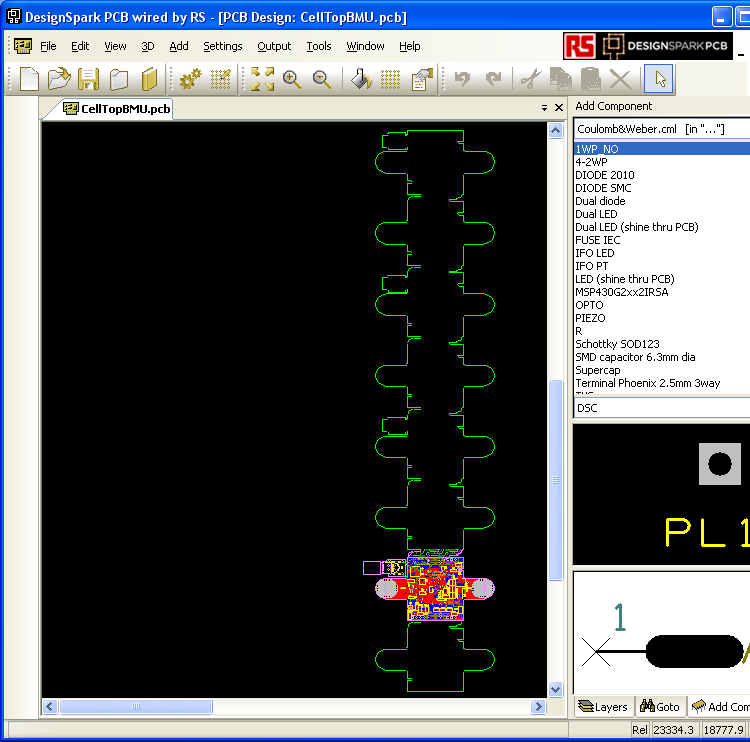 2) DesignSpark PCB design software, if you want to view and/or alter the PCB layout. 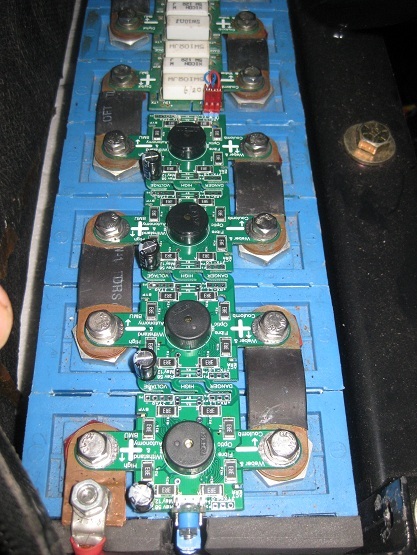 Remember that our PCBs are designed for 40 Ah cells, and should work unmodified with 60 Ah cells, but we haven't tested this. DesignSpark runs under Windows only. 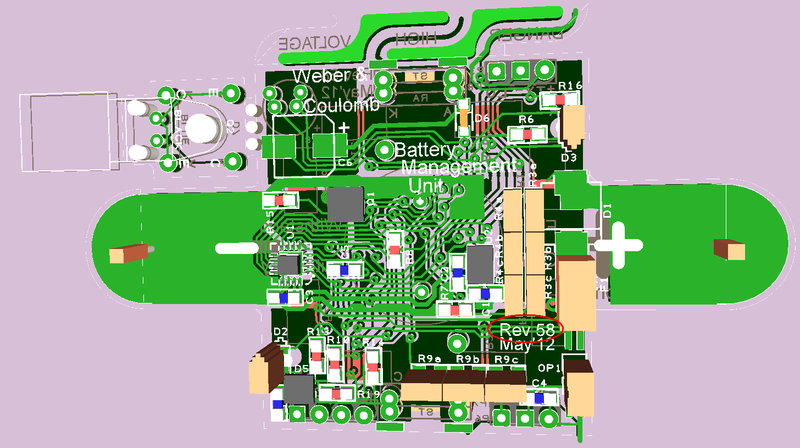 It is not size limited, it is freely downloadable from http://www.designspark.com/pcb (free as in no cost , DesignSpark is not itself open source). 60 MB download; loaded in about 15 seconds for me (cable connection). Activation is required, free, and moderately painless. The easiest thing is to just download the software, install and run it, and follow the prompts. I have listed some tips on using DesignSpark here. 3) Other useful software, for development: IAR Embedded Workbench (free, when you accept a code size limit), TeraTerm or other serial communications software, Cygwin and GCC for MSP430, but these can be the subject of another post. Here's how to get read-only access to our SourceForge repository, which has the PCB design files as well as the software that runs on the BMUs and the software that runs on the modified Tritium Driver Controls unit we use as our BMS master. If you want to save changes to these sources for others to use (e.g. you make a version for 100 Ah cells), you could send files to Weber or myself (PIM if you don't have our email address), or convince us that you are trustworthy so we grant you "commit" rights, or start your own project, on SourceForge or elsewhere. I'll start with installing TortoiseSVN. It's a pretty standard download and install, so feel free to skip the first few steps below if you already have it or know what you are doing. Start at http://sourceforge.net/projects/tortoisesvn/ . Wow, 118,000 download this week. This is a popular client. You can accept all defaults, though as a point of principle, I disable the American spell-checker dictionary, and make sure that the British English dictionary is installed first up. Here is the only slightly tricky part. 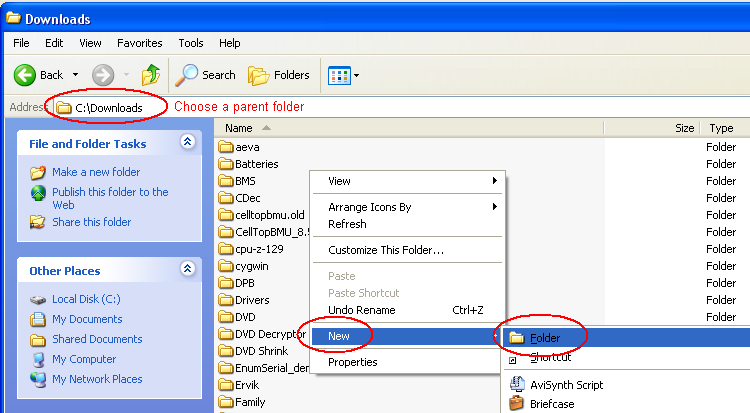 First, choose a suitable parent folder for the celltopbmu folder to situate in. I use c:\Downloads, where all my Firefox and other downloads go. I suppose this isn't strictly a download. The example screenshots are from Windows XP; I'm a Windows 7 resister, and I won't say anything about Windows Vista, but the results should be broadly similar. 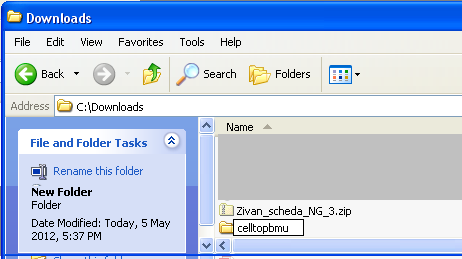 Create a new folder in the standard way, and call it celltopbmu (I don't think the actual name matters). 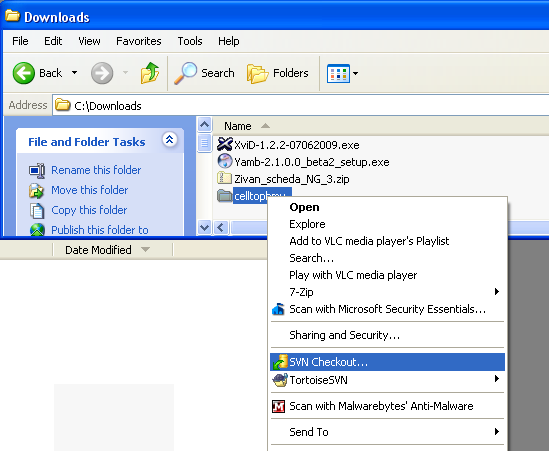 Right-click on the new folder to bring up the context menu and choose SVN Checkout... . The context menu is how you interact with TortoiseSVN; if you go to the start menu and run the "application", it just brings up a dialog box that tells you to use these menus, oh and read the manual It took a died-in-the-wool command line user like me a little while to get used to, but with a subversion client, you really are dealing with files and folders all the time, so it really does make sense. [url=svn://svn.code.sf.net/p/celltopbmu/code/]svn://svn.code.sf.net/p/celltopbmu/code/[/url] (changed late May 2013). If you click on this URL, it actually gives you a crude text-based traversal of the software. [ Edit: maybe it doesn't any more; now that I have Tortoise installed, it offers me to use that, or search for an application yourself.] You can get a slicker interface to the files here. This is near the start of the initial repository setup; eventually, the download should get to some 1123 kB transferred in 28 seconds (your download speed may vary). 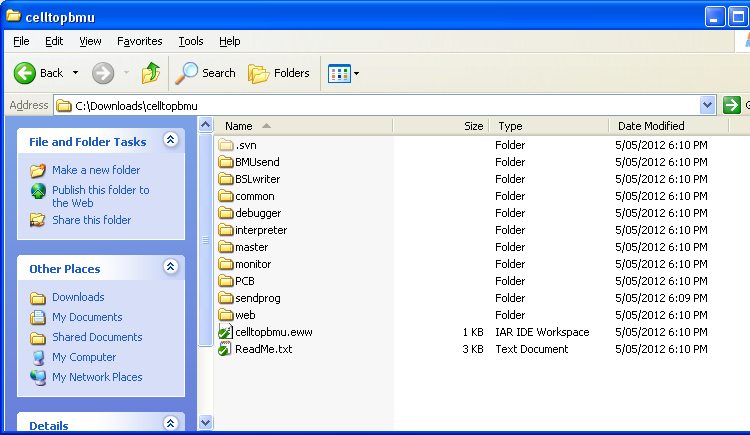 .svn is an internal folder that holds various files used by the subversion software. Ignore this. BMUSend: this contains a program for sending software to a string of BMUs at once. This is how you update the BMUs with the latest software revision, or switch from the debugger to the monitor, for example. BMUSend is written in C++ for Microsoft Visual Studio 2005. It compiles and runs only in Windows. See sendprog below for a command line C version that does broadly the same thing and can be compiled with the free GCC compiler. BSLWriter: this software writes the BSL, which is 256 bytes of highly optimised code that allows the software to update itself. It resides in flash memory that is usually reserved for calibration parameters (and there are a few bytes of that too), so it's more difficult to overwrite than ordinary flash memory. common: this contains some assembly language source code for the debugger/monitor/BSLwriter that are used by more than one of these pieces of software. debugger: this contains assembly language source code for the debugger, obviously. It allows interrogation of any cell's voltage, temperature, or link voltage, and these can be calibrated. interpreter: this contains a small Forth interpreter, the basis of earlier versions of the monitor software, which is so cute we couldn't bare to delete it. But it's not used directly by the main software at present. master: includes the BMS master software, and everything else that we put in our Driver Controls device(s). The source code for this is in C.
monitor: Assembly language source code for the monitor software, which is what ultimately runs in the BMUs. 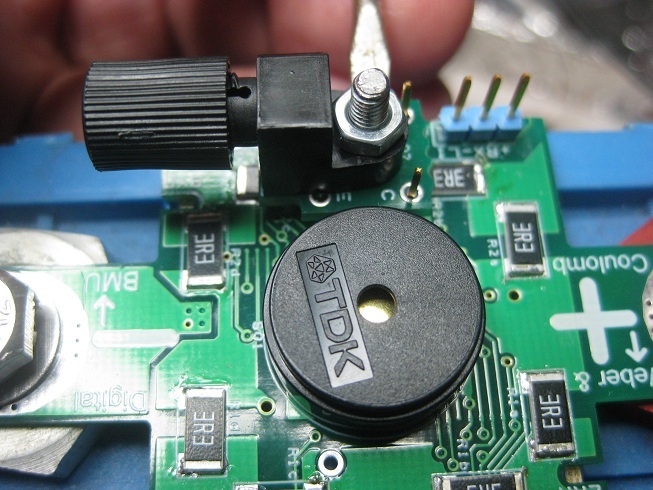 PCB: the DesignSpark design files for the BMU printed circuit boards. web: contains HTML and images for a web page that describes the BMUs. It has a pretty picture that is now quite dated, and the whole page needs to be brought up to date. Maybe soon. Don't be alarmed at the apparently mostly empty outline. There is a reason it looks like that! We get the BMU boards made in strings of eight, and it is convenient to start at the second lowest BMU in the string, and replicate it for final fabrication only after all the changes have been made (once, not eight times). Just put the mouse cursor near the middle of the coloured area and press "z" three times to get a more normal view. Good luck with it all. Oh, one final suggestion: don't try to change the outline as the first thing you do in DesignSpark. You'll likely get frustrated. It's easier to muck about with components and tracks first, and work up to outlines later. Be assured that almost anything you want to do with DesignSpark it is possible to do; it just might not be obvious at first how to do it. So stick with it, and don't give up on it prematurely. After all, after an extensive search and several times where we almost gave up ourselves, we always found a way to do what needed to be done. When installing IAR Embedded Workbench, if you are asked whether you want "dongle drivers" installed, click "No". (I chose custom install, and unchecked the dongle drivers option there.) On first launching IAR Workbench you are presented with a "License wizard" and asked to enter a license number. Click "Register with IAR Systems to get an evaluation license" and click "Next >". Follow the prompts in the obvious manner until you click "Register" and are taken to IAR's website. Under "Evaluation license type" choose "Code size limited". Complete the rest of the registration form and submit it with the license number blank, wait for the email, click the link in the email, copy the license number and paste it into the IAR License wizard and click "Next >". Then you should be up and running IAR Embedded Workbench, from which you can File / Open / Workspace / celltopbmu.eww. Last edited by coulomb on Thu, 02 Oct 2014, 03:55, edited 1 time in total. Note the "Large Box" it came in; the stack of PCBs weighs a surprising amount. That's a stack of 31 "boards", each of which contains 8 BMU bare boards (except the top one; it has a strip of 4 BMU boards taken away, which Weber populated this week and we tested today). Actually, they should have been delivered last Friday (last EV day), but the driver didn't seem to make much effort to find anyone to sign for the delivery, and took off before any of us realised he was here. So now we need to order a lot of BMU parts, and assemble 224 more of them. Meanwhile, the replacement boot floor has been welded into the MX-5, and the rearmost battery box (under the boot) has been test fitted. The boot floor needed some hammering to clear the battery box. Today we attempted to modify the BMU software to fit into the 8K of flash that the new processors have (current processors have only 2K of space, and a few important commands have had to be commented out to make it all fit). It might have worked, except that trying to load an 8K program with software that is expecting 2K bytes... it didn't fit. A bit of a catch-22 situation. We should have foreseen the need for this and started with 8K programs for the new processors. Actually, we'll probably end up with 4K executable images (4K should be enough for anyone ), and we would like to use the rest of the flash space for data logging. However, the MSP430 assembler seems to want to produce a binary file that takes up the whole of the flash space. I'm sure that there will be a way to do it, but it can wait for later. Edit: boot lid -> boot floor. Bit of a brain spasm there. Last edited by coulomb on Sat, 02 Jun 2012, 14:11, edited 1 time in total. coulomb wrote: Today we attempted to modify the BMU software to fit into the 8K of flash that the new processors have (current processors have only 2K of space, and a few important commands have had to be commented out to make it all fit). It might have worked, except that trying to load an 8K program with software that is expecting 2K bytes... it didn't fit. A bit of a catch-22 situation. We should have foreseen the need for this and started with 8K programs for the new processors. Tricky stuff. It took a LOT of head scratching, subroutine writing, and other optimisation to get my BMS firmware to fit (with all the features working) on my ATTINY13A processors. In the end I managed to pull it off with EXACTLY 1024 bytes, 100% full on the program flash. If I want to add any more features, I'll have to start breaking in to the assembly code. Nice work with your boards. I once wrote a word processor in 6502 assembler, 1979 I think it was. Haven't written anything in machine code since. Just thought I'd share that. When I were a lad we 'ad to toggle t' program in binary wit' front panel switches. Here are some photos showing the Newton/Coulomb/Weber adaptable fibre optic connector in all 6 of its possible orientations (a sort of Kama Sutra of phiba), and posing with another classic invention, the Dunlop Volley. No patent pending -- steal this idea. But remember, if you see someone else trying to patent it, you saw it here first. It has been wonderful having both Coulomb and Newton helping me these last few EV days (Fridays). And my teenage daughter has finally made a contribution to the project! She brought home a boyfriend who is an apprentice boilermaker (i.e. someone who can cut and weld steel). And he's a really nice guy, but don't tell my daughter I said that. Parental approval can be the kiss of death. Let's call him Henry. Those of you who have been closely following our epic saga may recall that we cut the floor out of the boot very early in the piece. We also cut away the bottom of the small well on the passenger side where the jack and tools live. Later we found that the battery box could be slung so low, even within the existing breakaway angle, that we needn't have cut anything, just whacked it a bit with a ball-peen hammer. Unfortunately, in the meantime, we had cut the boot floor up into little pieces, used it for welding practice, then sent the pieces for recycling. Possibly in a foreign country. So we considered finding the pieces and putting them back together again, for about zero seconds, then ordered one from our friendly MX-5 wrecker Richard Larsen. Eventually someone rolled their yellow MX-5 race car one too many times, and we got its boot. So one Sunday Henry helped me figure out where and how to cut out the pieces we needed. Henry also put the flap disk to work grinding off the paint where we would have to weld. The following week I cleaned up the pieces, wire-brushed, rust converted and penetrolled them. The next Sunday Henry stitch-welded them in. As you can see in the photo below, they look pretty awful at the moment, but once they have the welds ground, some seam-sealer over the joins, some red paint, then the original molded carpet, no one will know the difference. Except for everyone who reads this public post. The next photo shows the results of Newton's efforts over the last couple of EV days. He has been working on the bracketry to raise the Tritium WaveSculptor to within 0.5 mm of the underside of the bonnet so we can fit two grey contactor boxes under it, like the two you can see on the right. He also mounted the two aluminium-cased DC-DC converters you can see on the left, and remodelled the bonnet prop that used to go right where the WaveSculptor is now. For a very long time now we have been holding the bonnet up with a sky-hook. Well OK, a hook on a piece of rope tied to a joist above. But no longer! The prop now fits neatly between the WaveSculptor and the battery box and miraculously manages to miss all the conduits to and from the Wavesculptor as you raise and lower it. It is a cold-bending work-of-art on the part of Newton (Jeff Owen), as you can see below. So while Henry and I have been working in the boot and Newton under the bonnet, Coulomb (Dr Mike Van Emmerik) has been working in the middle, on the BMS. 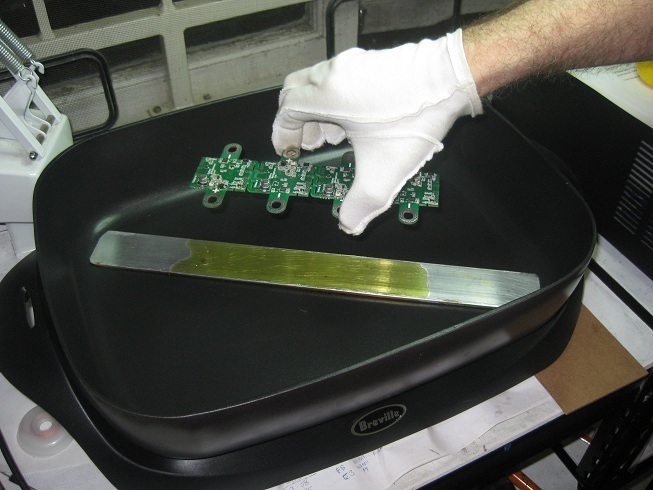 He has been testing a string of four cell-top BMUs built with the final PCBs, to ensure we have all the right component values before we go ahead and order parts for 250 of them. Coulomb has also successfully updated the bootstrap loader from one that loads a 2k image to one that loads a 4k image, and he did it using the existing bootstrap loader, not JTAG, so the update happened on all BMUs at once. Then he converted both the bootstrap-loader-loader software and the battery monitoring software to 4k images, so we can now fit all commands in at the same time. We're still hoping to use the rest of the 8k for data-logging, but first have to convince various things not to erase it when they erase the high 4k to replace the code. What you see is a string of BMUs lighting their red error LEDs to indicate (in this case) low cell voltage. In fact their cells have completely disappeared out from under them, over a minute before! What doesn't show in the photo is the blinking red light coming out of the blue fibre-optic connector, still sending telemetry telling of this extreme low-voltage (in fact zero volt) event. 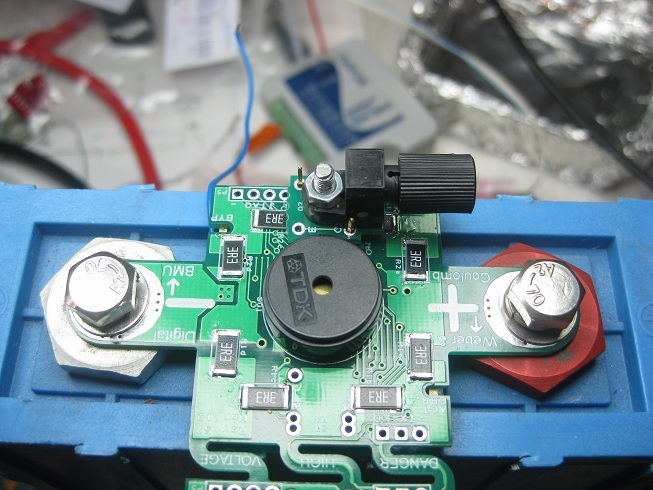 They can do this because our solution to voltage sag was was a 1 farad 2.7 V supercap across the 2.5 V regulated supply to the microcontroller. It is not visible in this photo. The cans you can see are ordinary 100 uF 16 V electrolytics. 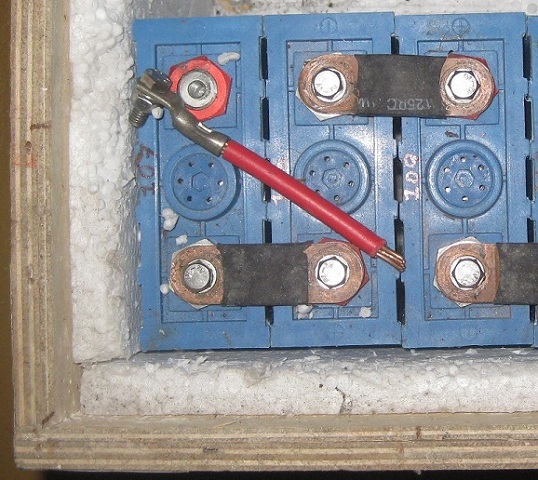 One 10,000th of the capacitance (though 6 times the voltage) of the million microfarad supercaps on the other side. 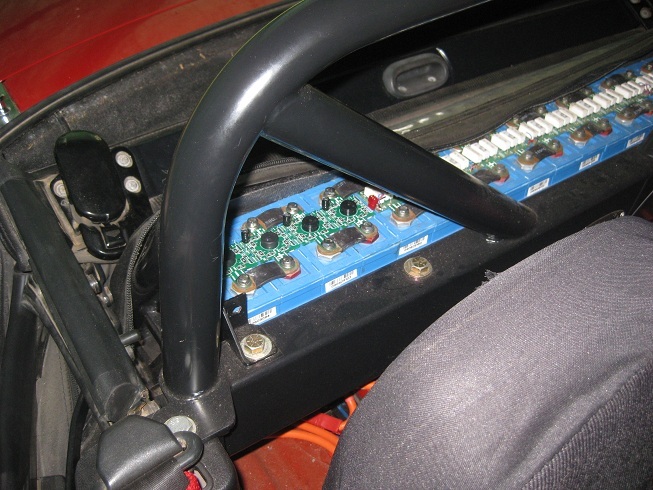 In the following photos you see the result of Coulomb's efforts installed in the MX-5 ready for a test drive. 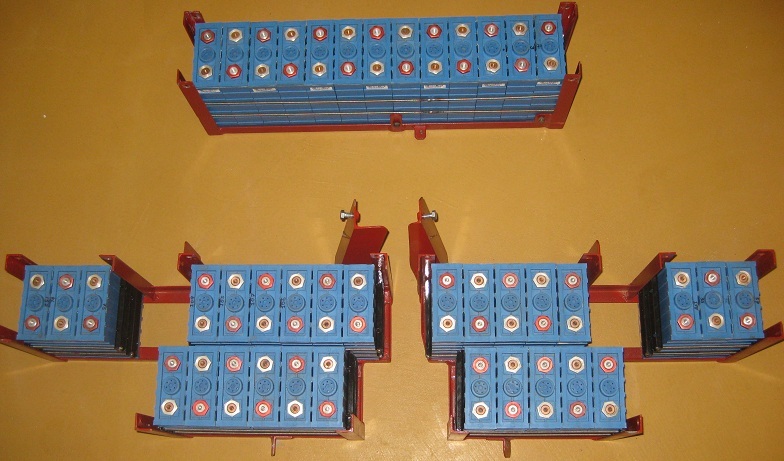 You can also see the older prototypes with the white 5 watt resistors. The supercaps are visible in these photos, looking like ordinary electrolytics. Element 14 were temporarily out of stock of the ones we wanted, so we settled for 8 x 11.5 mm for these prototypes, but the final boards will use 6.3 x 9 mm 1F supercaps costing 43 cents in 250 quantity. You can see the 8 small black surface-mount bypass resistors handling 0.5 amp, compared to the 3 large white thru-hole bypass resistors handling 1 amp on the older prototypes. The large black cylinder in the middle of each BMU is a 33 cent piezo-electric speaker. When we showed these BMUs at a Brisbane AEVA meeting, Tritium_James quipped "Can they play MP3s yet". No, but it's quite a cacophony when they all beep at once, with different frequencies. Last edited by weber on Thu, 06 Mar 2014, 14:09, edited 1 time in total. I'm thinking you lads may not hear the beeping of an unhappy BMU cell top card from under the bonnet, what with all the road noise. But those ones behind the seats are guaranteed to be attention getters. So what replaces the 5w resistors in the new design? PlanB wrote: I'm thinking you lads may not hear the beeping of an unhappy BMU cell top card from under the bonnet, what with all the road noise. But those ones behind the seats are guaranteed to be attention getters. Yes. In normal operation we won't be relying on the beepers, we'll learn about a distressed cell via the comms daisy-chain. In fact there doesn't need to be a human in the loop as the DCU (Driver Controls Unit) will be listening to the BMS comms and will immediately tell the motor controller or charger to back off its current. The beepers are a last-ditch insurance policy in case all else fails, particularly if the car is in the garage and some uncontrolled device is discharging the cells, or the charger has not shut off and is overcharging the cells. So what replaces the 5w resistors in the new design? The eight surface-mount 1 W resistors you can see arranged symmetrically around the beeper, along with the large areas of copper they are attached to. We are grateful to Nevilleh for this idea, even though it required us to halve the bypass current. Sanctified excrement! How did that get there? Even more sanctification of faecal material, is that strap to the left showing signs of arcing? Someone/thing has definitely been in there! Nevilleh wrote: Even more sanctification of faecal material, is that strap to the left showing signs of arcing? Someone/thing has definitely been in there! No. What you're seeing is blobs and smears of the "grey goo". The jointing compound that was applied not only between the straps and the terminals but between the straps and the prototype BMUs that were on top of the straps but have been removed to be replaced by the production version. Here's an interesting perspective on the MX-lightning. If you lie on the floor and hold your computer screen above your head, you can imagine you're under the MX-5, on the driver's side (right-hand-drive) with your feet sticking out the back. You're looking up through the space where the fuel tank used to be, and seeing 3 layers of cells, except that the lowest layer isn't there at the moment and you're looking through its empty box at the other two layers. 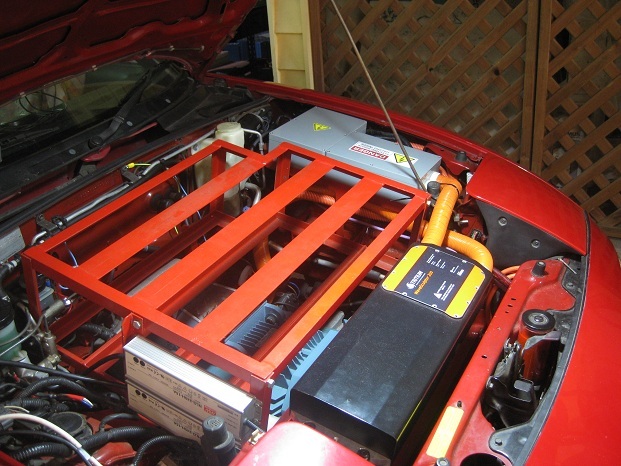 This is prime battery real-estate on the MX-5 because it's so close to the centre of mass. And you can only make use of this space with 40 Ah cells or smaller. 101 of our 228 cells, nearly half, are located in this stack. It's freaky just how well 40 Ah CALB/SkyEnergy or Winston/ThunderSky cells fit in these 3 layers (and in other places on the MX-5 such as under the boot and under the bonnet). So even if you're doing a much lower voltage MX-5 conversion than we are, I'd recommend using 40 Ah cells in buddy-pairs or triples. The highest layer, of which you can see the underside of one cell, is the single row of 19 cells behind the rollbar that you can see from the top about 5 posts back. Nice! ~13kWh of grunt literally backing you up, the tower-of-power. So 228 x 1.5kg = 342kg worth of 40 Ah + 90kg of ABB motor = 432 kg. If you removed 250kg of ICE detritus that makes you 182 kg heavier? What range you expecting from that 30Kwh battery pack lads? PlanB wrote: So 228 x 1.5kg = 342kg worth of 40 Ah + 90kg of ABB motor = 432 kg. If you removed 250kg of ICE detritus that makes you 182 kg heavier? We may be more like 300 kg heavier, as we kept the gearbox and so probably didn't remove 250 kg, and it probably comes to more like 1.7 kg per cell when you include the battery boxes, cables and ELV-segmentation contactors. And the motor is 95 kg and we also have controller, vacuum pump, power steering pump, DC-DC converters. Which is why we have the option of leaving half the batteries behind and having lower power and range but better handling. What range you expecting from that 30Kwh battery pack lads? Of course it depends on your speed, but I usually say 160 km. The deadline we're working towards now is getting the MX-lightning registered in time for the 2012 AEVA AGM and EV Festival. We've been assuming it's in Sydney some time in October but I don't see any posts about it. Newton (Jeff Owen) kindly came over last Monday afternoon and we did a production line on the 28 (!) 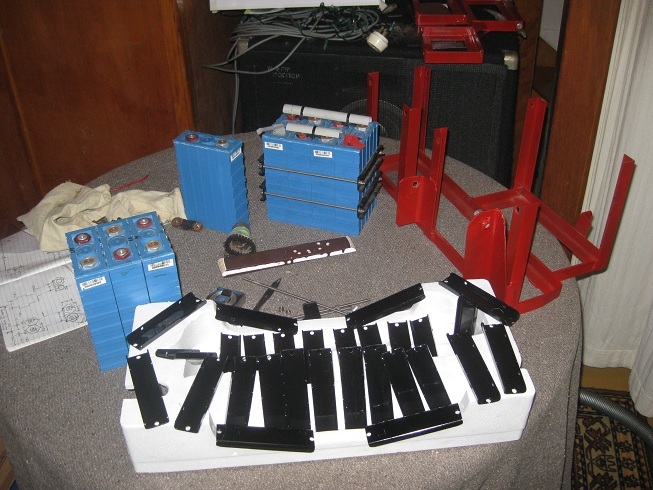 cell-clamping bars required for the two diff battery boxes plus the radiator battery box. These are the 3 smallest of the 8 battery boxes in the MX-5. The diff boxes go on either side of the propshaft and PPF, at the front of the diff. They constitute the lowest layer of the 3 layers in the fuel-tank space, as shown in my previous photographic post. 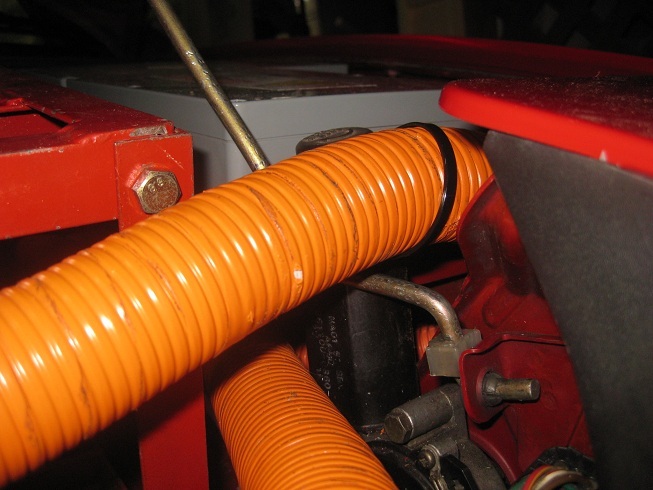 On the clamping bars supplied by the battery manufacturer, I filled existing holes with weld while Newton redrilled them in a better place, cut the bars to a better length and ground a radius on their corners. Then I deburred them and over the next few days primed and painted them. This was all Newton's idea so they would be ready for the Friday EV day. 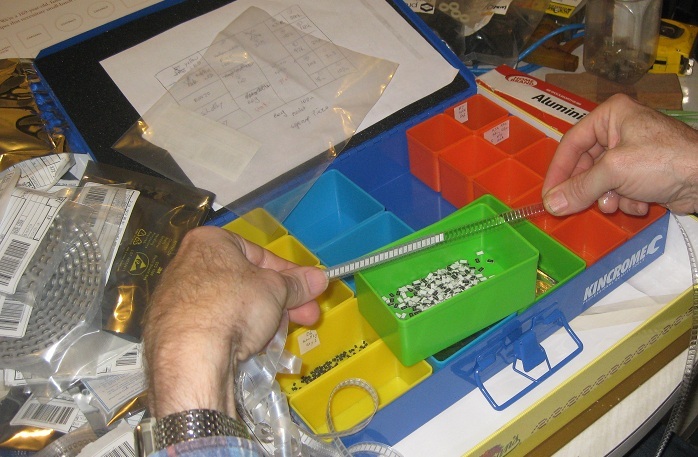 On Friday he cut the stainless rod and clamped up the sets of cells and put them in their boxes. 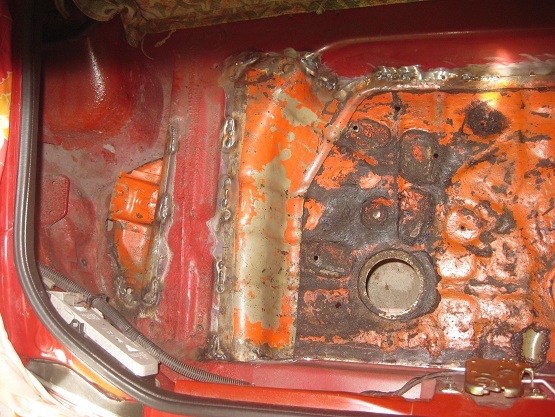 In the photos below, the box at the top goes in the space at the front of the vehicle where the lower half of the radiator used to be. The other two are the diff boxes. The boxes are 210 mm high. Each 40 Ah Sky Energy cell is about the size of a 1 litre UHT milk or juice carton. 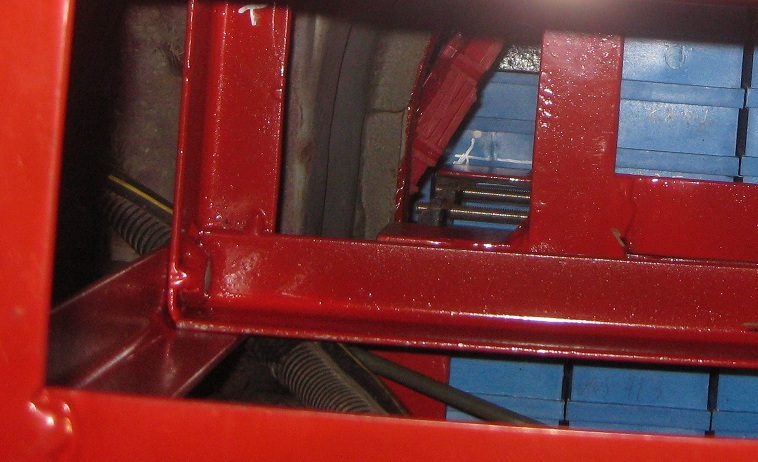 The gaps in the diff boxes allow for the chassis rails and hand-brake cables to pass thru. Last edited by weber on Sun, 15 Jul 2012, 19:37, edited 1 time in total. 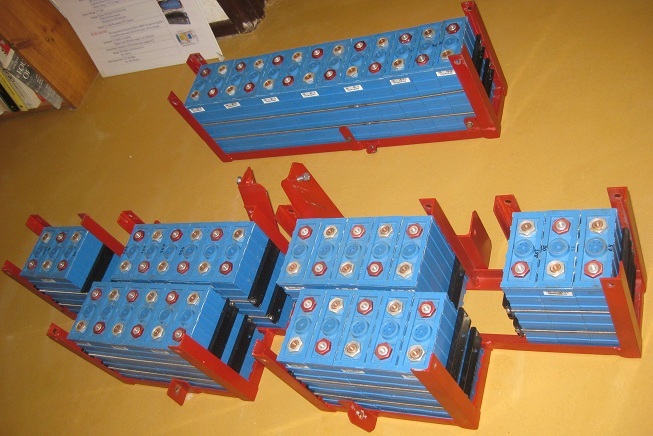 We now have all the parts we need to make 250 of our Battery Monitoring Units. Here you can see Coulomb stripping all the parts out of their tapes into a pretty-coloured parts box from Bunnings ($23), ready to be placed manually using tweezers under a magnifying lamp. 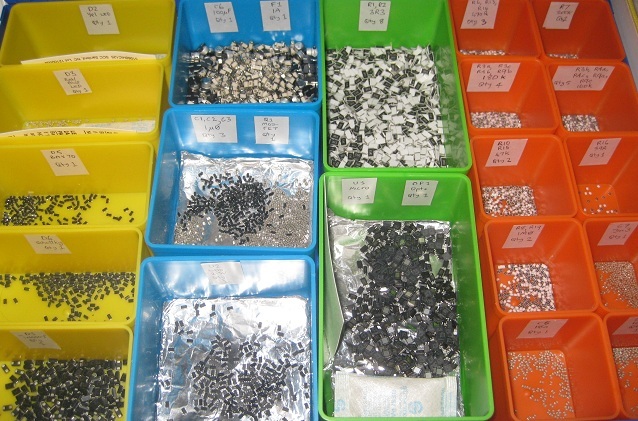 There are 20 bins and 23 different SMD parts (Surface-Mount Devices) so three of the larger bins contain two different (visually distinct) parts. You'll also notice that some bins contain alfoil for static sensitive parts and some contain dessicant packets and humidity indicators. And we have our new Breville "banquet-size" electric soldering-pan so we can solder the complete boards of 8 BMUs instead of having to cut them up. We got lucky and found one of these frypans at a clearance price of $35 inc postage ($138 elsewhere). Actually the oil is being poured onto the underside of the heat-spreader so it will end up between it and the the pan to increase conduction. Avocado oil just happens to have the highest smoke-point of any readily available cooking oil. Safflower is nearly as good. The board itself is fried dry on top of the heat-spreader. The Pb-free solder-paste needs to get to about 240°C. 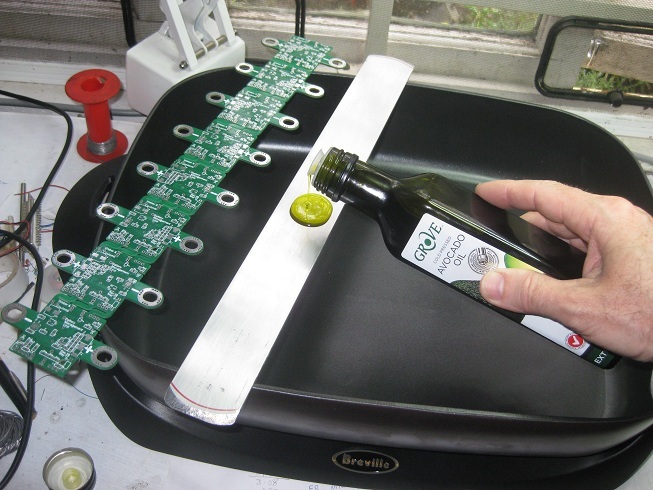 We're still waiting for the laser-cut mylar solder-paste stencils to arrive from Pololu. 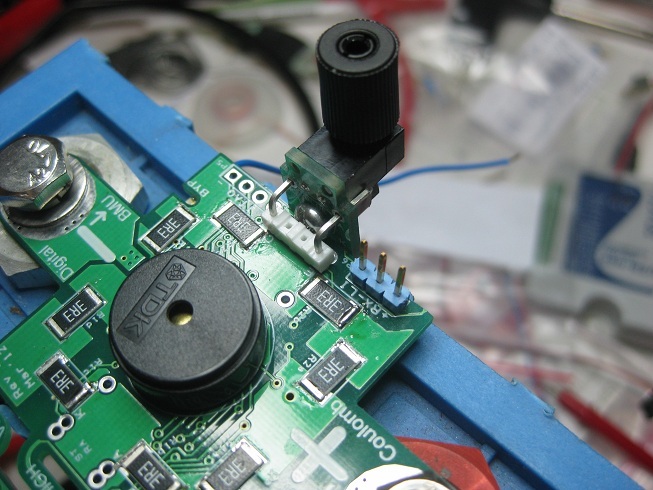 In the meantime I wanted to try an experiment with soldering SMDs on both sides of the board using the frypan. Coulomb was pretty sure it wasn't going to work, but he was willing to humour me. He said we should just do as we had done before and hand-solder the bypass resistors last, one-at-a-time, with soldering iron and solder. But my experience of hand-soldering them had been difficult (requiring 3 hands), slow and untidy, although Coulomb does a much better job of it. The idea was to stencil, place and fry the eight 1 watt bypass resistors on the top side first, then stencil, place and fry all the other components on the other side. 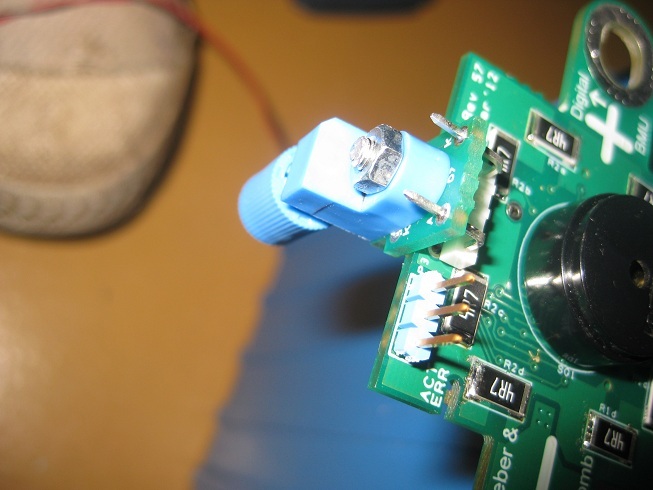 But the success of this second pass would rely on being able to conduct enough heat through the already-soldered bypass resistors and their heatsink copper. We risked a string of 4 BMUs for this experiment. Since we didn't have the stencils yet, we just blobbed the solder paste on with a syringe as usual. Here you can see the board after the bypass resistors have been fried on. We then placed the parts on the other side of the board and placed it, with bypass resistors down, on the dry heat-spreader. We tortured that poor board for about 10 minutes at the frypan's maximum setting (it usually only takes about 5 minutes), but the solder paste just would not melt, although it almost certainly burned off most of its flux and we may have damaged or prematurely-aged some components. So I thought, "What have we got to lose", and put oil on top of the heat-spreader in an attempt to improve conduction between it and the board, so the bypass resistors would be completely submerged in the oil. Here you can see it going back into the preheated pan for its second torture session. Again we watched through the glass lid for signs of the solder-paste melting, as indicated by it going from grey to silver. After another 10 minutes we decided that it was melted but the lack of flux was preventing it from achieving its usual gloss. So we took it out, let it cool, cleaned the oil off with metho ("denatured alcohol" for you Americans) and Coulomb began programming and testing each BMU in turn. To our great surprise they worked! At least as far as he got testing them before he had to leave. The three that he tested all passed the "turn on all 3 LEDs" test, and we were very pleased to see that the new-model blue LEDs were much brighter than those we had used in earlier prototypes. But we will not be putting those poor tortured BMUs into any vehicle. They will go to the "prototype museum", or the rubbish bin. "We will welding your work together well." Last edited by weber on Mon, 16 Jul 2012, 18:11, edited 1 time in total. This photo was taken before we made a great discovery in SMD part unpacking: the large funnel. Weber found a selection of funnels to try, one of which was about 150 mm across the mouth. This turned out to make unpacking really easy; I could just unzip them at high speed, and they would spill into the funnel and into the small containers. Of course, when we get to the last boards, we might find that too many of them ended up on the floor or amongst the equipment on the bench. I coated the funnel with alfoil for the processors, since rubbing against the plastic of the funnel may not do them much good. Fortunately, it was a rainy day, so there was plenty of humidity to kill any static build-up. When done with the components, we close the lid, which has foam in it, to make it somewhat air tight. When the parts were unpackaged, it was a little disappointing to see that for example 500 0805 capacitors doesn't even cover the bottom of the smallest of the bins (the orange ones) in that tool box. By the time all the packaging was removed, the volume had reduced by at least 90%. What's left is about $1200 worth of parts (plus GST and import costs), excluding the piezos, the super-capacitors, and a few connectors. Last edited by coulomb on Mon, 16 Jul 2012, 19:18, edited 1 time in total. 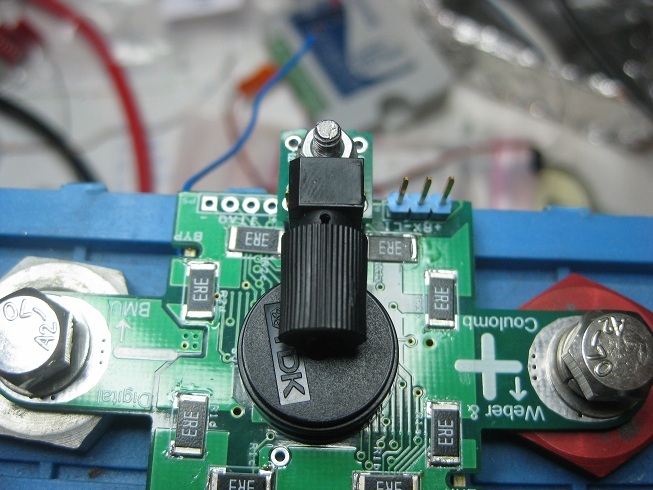 coulomb wrote: What's left is about $1200 worth of parts (plus GST and import costs), excluding the piezos, the super-capacitors, and a few connectors. So to avoid the delay, we could have broken the order into two parts, both under $1000. We'd still have qualified for free shipping (Digi-Key offers free shipping on orders over AU$200). why didn't you just get the boards made in china? Those bypass resistors and their heatsink solder pours are going to take a while to solder with hot air. You have to heat the entire solder pour up since it's doing its job and sinking heat away from the resisors. This means lots of moving the hot air gun around until the whole board it hot enough to melt the solder. A better tool for this would probably have been an IR rework station. A chinese reflow oven is only $400 or so (from memory). I've done a batch of my own BMS boards in one. There are considerable fewer parts on my boards than yours, and it still took myself and another friend (both of us with a fair amount of experience working with SMD) a full 9hrs to do just the SMD components for 100 boards. The parts on the bottom were done (placed and reflowed) first, then we placed the parts on the top and reflowed the boards again. This worked well, and the microcontrollers only went through the oven once. I've decided that for any batch boards like that in the future, I'll be having them made in China. $2 per board is worth the 20+ man hours it took me to make my first 100. That said, since you're already committed to making yours by hand, the stencil will make things a LOT easier. Adverse Effects wrote: why didn't you just get the boards made in china? You choose to be anonymous. That's no crime in itself. But you have made unfounded criticisms of myself and others in the past, e.g. and never retracted or apologised, even when it was made abundantly clear (in my case from public sources which you might have checked before making the criticism in the first place) that you were wrong. Your anonymity then means that you do not suffer any consequences for your real-world reputation, while those of us that you falsely criticise may do. So I was at first not inclined to respond to what might have been mere trolling on your part. But I will give you the benefit of the doubt. (a) They would not be the same price or cheaper. The bare boards are already made in China. The parts could not be significantly cheaper unless they are inferior. There must be additional costs for re-reeling of parts tapes, auto-place machine setup and operation (or manual labour for placing parts), framed metal solder-paste stencil, and soldering, but yes it would probably not be very much more and we will probably do it next time. (b) I don't have regular paid work at present so it doesn't make sense for me to pay someone to do what I can do myself, until I get bored with it. Last edited by weber on Sat, 29 Jul 2017, 06:15, edited 1 time in total.